It seems that a couple of you rather enjoy my references to TBM (yes, I’m looking at you Annie & Shirley), so I thought I’d share a little anecdote with you. TBM rolled in to the office today a little before 10am (he had an appointment with someone in our office at 10am, otherwise I wonder if he would’ve come in at all). He called me into the office, and as I walked in he threw a Target bag on his desk and said “I don’t have time for this…separate all the house stuff from the medical stuff…” then resumed looking through his desk for whatever piece of paper he had misplaced in the 30 seconds since he’d been in his office. What I expected to see: at least three months worth of unopened personal correspondence for all his bills and what not. He hasn’t had me do that since March or April, so I figured he had finally gotten around to emptying his car and brought it all into the office. Please take note that although I am writing a semi-bitter and not enchanting blog about TBM, I have been courteous enough to edit out the credit card information from one of his receipts (I hope I did that right…). Yep, crumpled receipts. See, TBM is remodeling the house he just bought, and doing a lot of the stuff himself and overseeing contractors and what not, so there are dozens upon dozens of receipts from Lowes, Home Depot, and a bunch of random contractors. I was really tempted to add up all the totals, but thought it was just be depressing, so I restrained myself. I did separate them neatly, at which point I asked what he wanted done with them. 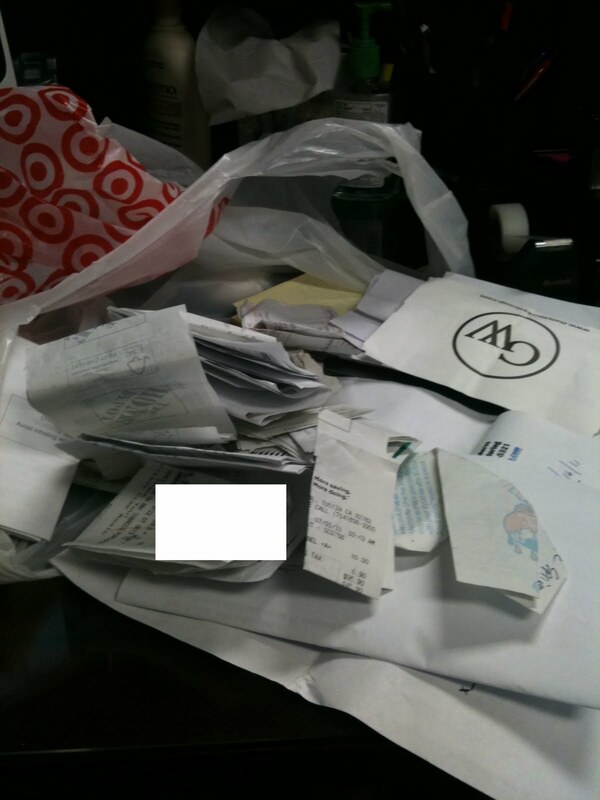 I asked where he wanted the miscellaneous receipts that had nothing to do with his construction, since the whole point was to separate stuff out….